Applicants must either be registered for a PhD in South Asia, the UK, or in other EU countries, or have graduated from one of these countries within the last two years (i.e. have passed their PhD no earlier than the 1 December 2016). BNAC requires candidates to submit evidence of their eligibility along with their paper. Applicants who took part in the 2018 Prize competition and did not win the prize may also apply with a new paper, if they meet the above eligibility criterion (point 1). The PhD paper should be in the fields of the social sciences or humanities, and related to Nepal or the Nepali cultural world, broadly understood. (Clarification: (a) The PhD paper must be single-authored, and (b) papers in technical fields dealing with social dimensions, such as public health and community forestry will be accepted). Notification of the winner: 31 January 2019. 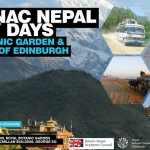 Award of the prize: 15-16 April 2019, in Edinburgh, at the BNAC Nepal Conference. The winner will be selected on a competitive basis by the BNAC PhD Dissertation Prize sub-committee. One winning candidate will receive £250 cash prize. Candidates coming in the second and third place will also be named. The prize winner is encouraged (not obliged) to attend the Nepal Conference (Nepal Study Days), and to present their paper there.